As a young mother Kate Braestrup discovered the fierce protectiveness that accompanies parenthood. In the intervening years--through mourning her husband and the joy of remarriage and a blended family--Kate has absorbed the rewards and complications of that spirit. Inspired by the families she meets as a chaplain and by her son's journey, Kate examines the twinned emotions of faith and fear, and learns that the threats we can't predict are the ones that rip us apart--and knit us together. Kate Braestrup serves as chaplain to the Maine (Game) Warden Service. She is the author of a novel, Onion, and several bestselling memoirs. She has written for O, the Oprah Magazine, the New York Times, More Magazine and the Huffington Post. She lives in Maine with her husband, Simon van der Ven, and their six children. "Kate Braestrup is at the very top of her game with Anchor and Flares. She's working to understand the very heart of parenthood--the weave of attachments that make it almost impossible to do what we know we must: let go." 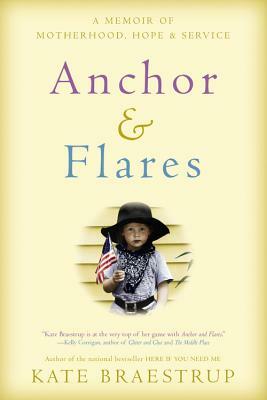 "Reading Anchor and Flares is like having a fiercely compassionate and comically no-nonsense best friend meandering with you through meditations on faith, war, death, and parenting. Why? Why? Why? Braestrup asks a million times, in a million different ways. Sometimes the answer is courage or grief or hope. But usually it's love." "Sensitive and wholesomely charming, the book is refreshingly free of preachy proselytization and instead addresses the bittersweetness of parenthood and perennial nurturing. Braestrup delivers another appealing, tenderhearted memoir braiding faith and family."